← Rover Round Table Vs National Youth Network Part 1: Fight! So I left off Part 1 with the pro’s and con’s of the National Youth Network (NYN); mainly that it provides necessary (for our organization) learning experiences, but for only a small number of youth. The other side of this particular discussion is the the Rover Round Table (RRT). This provides similar life lessons to a broader number of youth, but to a different degree. There has been some small momentum over the last few years to properly form a RRT in my council (Pacific Coast Council); sadly way too small for my liking. Over time, I’ve had the chance to slowly perfect my mental model of how the RRT would fit into the current system. It was only quite recently that all the pieces truly fell into place in such a way that they supported each other. I’d like to share that model with you today. 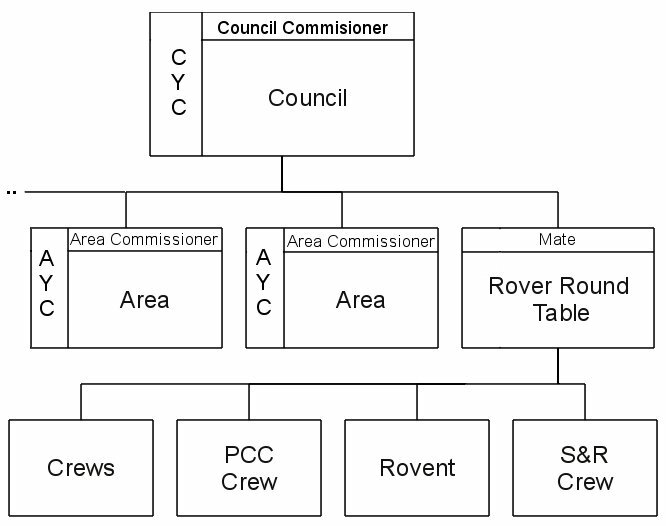 The Rover Round Table should be treated equally to an Area Service Team, and consequently the RRT Mate treated equally to an Area Commissioner. Obviously the RRT does not service a geographical area within a council, but the entire Rover section across the council. The same activities that an area service team work on matches up with the RRT: program, training, honours and awards, treasury, and communications to name a few. All the current and future Rover entities (some that don’t fit into the past model) can be serviced by the RRT, just like groups are serviced by areas. In this relationship, the RRT and Mate would be tasked with servicing the crews, while leaving crews the autonomy they deserve; just like groups currently enjoy with areas. If anyone tried to put pressure on the RRT to “control” crews, they could be rebuked with the note that Areas have no direct control over groups, so why should the RRT have any control over crews. The RRT would provide a breeding ground for future area and council service teams as individual Rovers grow in experience and became qualified for positions before they even started the job at an Area level. The NYN may give commissioner experience, but that’s only one person on a team. If we claim to be the youth development movement, why do we have so few young adults? How can we develop youth into full engaged and capable adults if we have no young adults? That’s proof we aren’t developing people in the right way. This is an amazing opportunity to begin to fix that. There have been some prior versions of interest crews, but Scouts Canada’s current model didn’t create the right environment for proper development. Medvents (first aid) and the PCC crew (leadership & management) are two examples of crews that brought together Rovers by interest, and not by geographical location. A Search & Rescue crew is another example (In the works, with more details in the coming weeks). By having the ability to create and support Council sized interest crews, we increase retention and interest in Scouting. If the recent hardships in attempts to create a charter for this type of crew is typical, we won’t get many. If we wish to remain relevant to today’s youth, interest based crews are the best way forward. They create buzz since you get youth tackling projects that inspire them that would never have been possible with small numbers. There has to be a better way forward and I put forth that this model is it. The knock against RRT’s that they have a tendency to become too Rover centric is a moot point. Would one accuse an area service team for being too inwardly focusing? That’s their job, to worry about their groups. Yes, areas should talk, share and work together. At the end of the day though, the vast majority of their time and resources should be spent on themselves. The same holds true for a RRT. They should be involved with the general Scouting community, but focused on Rovers. Now here comes the fun part. Given a few years time into this model, and you would expect to see some Rovers graduate from RRT to area service teams. Since the RRT covers the entire council, you would see a stronger link between areas since area members now have a deeper connection with different area member. The friendships and bonds created at the Rover level will continue into adulthood. The NYN and RRT both have pros and cons. If we work together, they can cover the other’s weak points with their strengths and be stronger together. The NYN can further cover the “insular” problem by working on problems that cover a broader scope. Additionally, since the Mate and potentially other positions are voted for by the crews, and the Council Youth Commissioner is appointed, we get twice the chance of having a strong voice for the youth. I’m not naive enough to think that politics couldn’t influence the choices for both of those positions, but at least there is a hope. If the NYN and RRT can cover each others weaknesses, both gain strength. It is in both their best interest to support the other. So great. We have a model. She’s pretty. Now how do we get it to materialize? No one’s going to jump on the bandwagon if it doesn’t exist. I believe most people will only join something that already exists over creating something from nothing. Then we must act like it exists. Not pretend like it exists. Act. If the purpose of the RRT is to service and support the current crews, their development, their activities and their members, then what is stopping us from doing so? Today? Are you waiting to be asked? Told? Appointed? Anointed? I cry capital BS. Those who wish to join me in servicing crews, I start today. If we build it well, they will come. Our sticking point has been getting buy-in. Well if our current offer is, “Come out to more meetings/ add more work to your plate in return for something potential”, no wonder we’re not getting any bites. Sometimes you have to (and I feel slightly dirty for this) give away some complimentary food, medical supplies, and phase compensators in order to create an alliance. It’s time for Rovers to start serving Rovers, and proving we deserve to be taken seriously. Asking to be taken seriously proves we shouldn’t be. As always, your thoughts, comments, additions and questions are welcome.